Digi-Schlock: THE BEAST WITHIN (Scream Factory Blu-Ray) – Schlockmania! Given its access to the MGM catalog, Scream Factory is sitting on a lot of horror titles that collectors would love to see in high-def. To their credit, they are prolifically doling out a lot of key cult titles from this substantial archive. 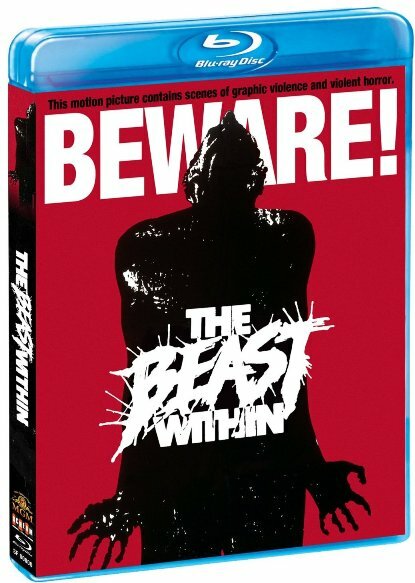 One of the most recent is The Beast Within, an early ’80s shocker that became a cult fave on home video. It’s not the full-blown special edition you get with some Scream Factory releases but it does offer a nice A/V upgrade plus a few choice extras that make it much better than your standard catalog reissue. Things start swimmingly with a new anamorphic transfer. It easily bests the earlier MGM DVD edition, offering a new depth to the color palette and impressive clarity that shows off how well-shot this film is. It also includes a lossless presentation of the film’s 2.0 stereo mix. The results sound nice and crisp: dialogue is clear throughout, the sound effects have punch and the thunderous Les Baxter musical score has the proper amount of sonic muscle. This disc also features a pair of audio commentaries that make their debut here. The first features director Philippe Mora and star Paul Clemens. The two have a fun, jokey rapport, with Mora deploying a sly wit while Clemens cracks bad jokes with gleeful abandon. It takes a little while for the two to find their rhythm (the excited Clemens talks over Mora early on) but the results offer plenty of interesting factoids, with Clemens being particularly sharp at remembering the most obscure things. For example, there are tales of the film being picketed by the KKK for having a black cast member and a really unique tale of how a crew and cast member who worked together on the traumatic finale ended up getting married afterwards! Elsewhere, Mora speaks frankly about how he had to tone the film down to appease the studio execs and Clemens offers an interesting discussion of the transformation sequence, revealing how the effects were done and what it was like to be in the middle of all that latex and bladder work. The second commentary track features Tom Holland and is moderated by Robert Galluzzo. These two have worked together before on commentaries so their comments have a nice, steady flow. Holland offers plenty of interesting detail about how he transitioned from acting to writing and the nuts and bolts of how this, his first produced script, came together. Basically, he was hired by producer Harvey Bernhard to concoct a story revolving around a man-to-monster transformation scene (the book that is listed in the credits of the film actually hadn’t been written yet!). He talks about reverse-engineering the story to fit this purpose and how he designed it to reference gothic horror literature, especially Lovecraft. Holland also discusses how the expositional scenes were cut by the studio and how the nature of his monster changed from the script as the film went into production. Fans will be glad to hear him give his full explanation of the film’s backstory, how the curse it revolves around works and why the cicada is used as a metaphor in the film. Galluzzo asks some good questions about his writing process and the film’s history but Holland doesn’t need much prompting. A particularly interesting moment arrives when he talks about how he later explored the same revenge, curse and rebirth motifs from The Beast Within in his more successful later effort, Child’s Play. The disc closes out with a few promotional materials. First up is a theatrical trailer that uses the kind of charming huckster-style come-ons not seen since the days of William Castle, complete with warning about the film’s “shocking” transformation scenes. There is also a pair of radio spots that mine the same territory as the trailer’s narration. It’s fun stuff, the kind of thing one wishes would be revived for modern film promotion. All in all, The Beast Within is another quality catalog release from Scream Factory, boasting a strong transfer and throwing in a few good commentaries that shed light on the film’s tortured genesis. Fans of early ’80s horror shouldn’t hesitate to snap it up.